Berkeley is the quintessential college town. Located along the eastern shore of San Francisco Bay, the city is well known as a bastion of liberal thinking, which is centered on the University. The town itself is home to over 112,000 residents. The town grew up around the University, which was founded in 1868, making it the oldest in the University of California system. The University is one of the most prestigious in the world. It has consistently been ranked among the best, if not the very best, undergraduate public university. This makes admissions to the school extremely competitive, and each of the some 36,000 students who attend had to work very hard to get where they are today. Berkeley wrote the book on college towns, so it only makes sense that the best time to look for an apartment here is during the summer months. By the end of May, many of last year's graduates have moved away to start their new careers. This makes June and July ripe for picking new apartments. Most Berkeley landlords are used to renting to students. This makes them more open to renting to student populations than some landlords might be in larger centers that aren't so dependent on their schools. You should be prepared to answer some questions about your program and funding. Professors from the University also make an excellent source of references. The liberal mentality in Berkeley extends to transportation, and passionate environmentalists have worked hard to make the city as bike and pedestrian friendly as possible. Cycling is a great way to get around town, with ample bike paths and even special laws allowing them to make turns in places where cars can't. Public transit is also available, and the BART system offers excellent service in town and throughout the Bay Area. The Berkeley Repertory Theatre is one of the best-regarded theatre companies on the west side of the country. Any lovers of cultures should appreciate the work they do. Pyramid Brewing & Alehouse is a local brewery that offers tours and tastings. The University itself is home to many attractions and museums. The downtown farmers market is a great place to get groceries, enjoy performances or grab a meal on Saturdays. For student-friendly bars and shopping, head down to Telegraph Avenue. The Lawrence Hall of Science is a great place to take kids to, as the interactive displays will entertain them while also engaging their minds. Touring the entire Berkeley campus is something that should be on everyone’s list when they make a visit to the legendary college town. Among the most well-respected and liberal colleges in the country, Berkeley has produced some of the brightest minds in the country. To get one of the best views in the city, you need to pay a visit to Sather Tower on the University campus. 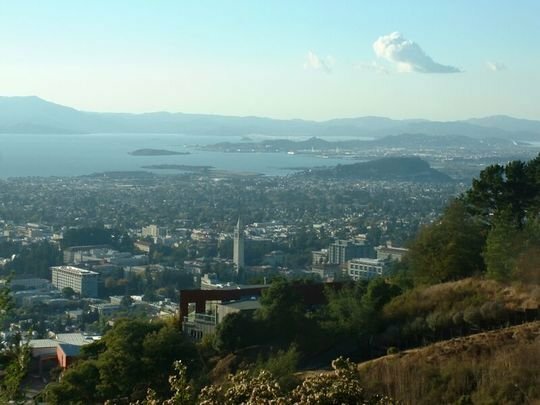 The tower itself is impressive, but the views it offers from the top are the best of Berkeley. Rivoli is an unbeatable choice for fresh Mediterranean inspired food. If you like affordable food and tacos, you should probably just become a regular at Tacos El Atulense. When you're looking for a meal in the morning, Venus has a great breakfast whether you prefer a down-home meal of eggs and bacon, or something lighter. Vegetarian options ensure it is perfect for anybody. Pizza is one of the most popular types of foods in Berkeley probably due at least in part to the huge student population. The Cheeseboard Collective is widely regarded as one of the benchmarks for California style pizza. If you ask anyone in Berkeley which bar to visit first, you're likely to only get one answer: “The Albatross.” This local landmark has board games, serves popcorn, and a good selection of beers. It’s a relaxed bar that provides the perfect place for meeting up with friends. There is also a good brewpub scene in Berkeley. The Pyramid Brewery & Alehouse and Triple Rock Brewery & Alehouse both make excellent in-house beer. If you prefer to dance the night away, you can certainly find options in Berkeley for that as well. The Berkeley Underground is one of the most popular dance clubs with the college students. The liberal atmosphere and college-town foundation of Berkeley make it a cultural hotbed. The Berkeley Repertory Theatre is just one of many high-quality theatres in the city, and is a Tony-award winner. It is generally considered one of the best theatres outside of New York in the entire country. There is also an incredible number of museum in Berkeley. The Berkeley Natural History Museum, the Berkeley Art Museum, and the Museum of Palaeontology are all great places to visit. However, these are just the tip of the iceberg when it comes to cultural opportunities in Berkeley. The University is also home to a number of fantastic groups that perform regularly, such as the UC Jazz Ensembles. The Berkeley World Music festival enjoyed it's twelfth anniversary in 2015. The June festival is an opportunity for Berkeley residents and students to enjoy the very best in World Music throughout several different venues in People’s Park and on Telegraph Avenue. There are also a handful of events that provide patrons with the opportunity to samples some great food, such as Taste of North Berkeley and the Chocolate and Chalk Art Festival. The Solano Avenue Stroll is an event that has been taking place for more than 40 years each September. The massive street festival includes more than 150 craftspeople, 50 food booths and many, many other exhibitors. The fourth street shopping district is certainly home to some of the best shops and restaurants in the city. Major players like the Apple Store and Crate & Barrel rub shoulders with art galleries and independent cafes. The truth is that most of the city is centered on the idea of local business. The liberal value system runs deep in Berkeley, and that means that most of the city is a place where independent businesses truly have a chance to shine. The Elmwood District is another great shopping strip that also includes the famous Elmwood Theatre. There are more than 80 shops and restaurants in this area centered around College Avenue and Ashby. Like most college towns, the people of Berkeley support the local University’s teams with almost rabid fanaticism. In the case of UC Berkeley, the team in question is the California Golden Bears. More than 30 teams from the University use that moniker, and the Division I program has well attended games in almost every sport. Marshawn Lynch and Aaron Rodgers of NFL fame are both alumni of the football program. In addition, Oakland is only a few miles away from Berkeley, and many Berkeley residents also support the Oakland Raiders of the NFL, often making the drive down to watch the team play. The Shorebird Park Nature Center and Adventure Playground is the perfect place to take kids who like to be active. Zip lining is a popular activity here, and the kids and parents can actually get tools and build and alter the playground. Sailing and boating are popular activities near Berkeley, and if you don't have your own boat you can easily rent one or take a trip on a larger vessel. Cesar Chavez Park has some of the best views in the bay, and more than 90 acres of land to explore. If you're a dog person, there is also a very large off-leash dog area that is perfect for getting your pet as much exercise as they can handle.